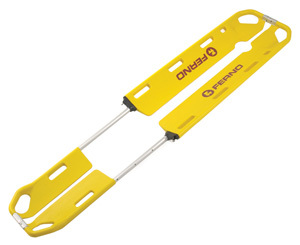 Ferno's Scoop EXL Stretcher provides superior comfort and safety to patients who need spinal immobilization. The Scoop EXL eliminates the need for log-roll maneuvers, which significantly decreases movement to the cervical spine. Easy-to clean surface is impervious to fluids. Thermally-treated polymer construction does not get too hot or cold, allowing for greater patient comfort. Four adjustable length options accommodate patients of different heights. Narrow foot end and split-apart design provide easier use in confined space immobilization.